As Pennsylvania legislators begin to consider legislation that would enable community solar in the Keystone State, it’s important to learn what we can from other parts of the country that have successfully implemented this innovative approach to ensuring that everyone can benefit from solar energy. Minnesota’s robust community solar program is one great example. Eichten’s Hidden Acres Cheese Farm in Center City, Minnesota has been producing artisan cheeses and bison meat products in Minnesota for three generations. But for the past few years, the farm has been growing a new crop thanks to a 5 MW community solar array installed on their grounds—solar energy. Let’s take a look at how agricultural businesses like Eichten’s Hidden Acres have benefited from community solar in Minnesota. In 2012, Ed Eichten worked with IPS Solar to install a 40 kW array to power his family’s commercial dairy and cheese operation. The solar array allowed them to save money on electricity while also promoting clean, renewable energy. Four years later, IPS approached the Eichtens again with a bigger offer: installing a much larger community solar array that would provide energy to subscribers from around the region. Unlike the farm’s original solar array, this installation offers energy to electric consumers who are unable or uninterested in having panels on their own property, while still allowing them to enjoy the financial and environmental benefits of being solar-powered. The 5 MW array produces enough electricity to power around 1,000 homes. The farm’s 5 MW community solar array can produce enough electricity to power around 1,000 homes. Currently, a local school district, an elderly care facility, and several smaller subscribers are purchasing the electricity from the community solar array. “We are passionate supporters of solar energy and would like for as many people to take advantage of solar as possible, but we understand that not everyone has the ability to install solar themselves,” the Eichtens said. The community solar array also provides substantial benefits to Eichten’s Hidden Acres via a 25-year land lease. The farm is guaranteed $800 to $1,000 per acre per year for 25 years, with a 2.5% price escalator. Ed estimates that without the solar array, that land, much of which was marginal, would have only earned him $400 to $500 an acre per year. When his peers argue that he is taking agricultural land out of production, Ed counters that the solar array helps keep his dairy and cheese business solvent. It also provides a measure of long-term financial stability that often eludes family farmers. “This is a nest egg for my children,” says Ed. Consistent with his environmentalist values, Ed worked with IPS solar to ensure that the land under the solar arrays was managed responsibly. Like a growing number of “solar farmers” in Minnesota, Ed has planted pollinator-friendly plants amongst the solar panels, providing habitat for the bees and other insects that help support agriculture. 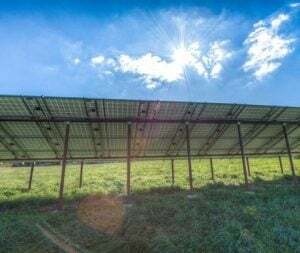 Should Pennsylvania pass community solar legislation, arrangements like these could provide similar benefits to farmers and electricity consumers across the Commonwealth. 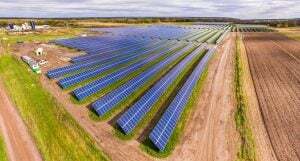 Consumers who are otherwise unable to install panels on-site can still enjoy the benefits of solar energy and farmers can gain a predictable, lucrative source of additional revenue to help keep them in business. Especially in the case of Pennsylvania dairy farmers, who have been weathering falling dairy prices and oversupply issues, community solar could be a lifeline. We expect legislators in both the Pennsylvania House and Senate to introduce community solar-enabling bills in the coming weeks. Keep in touch with Solar United Neighbors to be sure you’re notified when that happens.